Earlier this week I took a little jaunt across the Park to visit the Central Park Zoo. First things first, how cool is it to be able to WALK to the zoo? About 20 minutes after I stepped out the front door I was inside the front gates and strolling through the tropical zone, which is a pretty good place to be on a cold winter day, assuming you like birds. The tropical zone is open air and the birds fly freely through the exhibit. 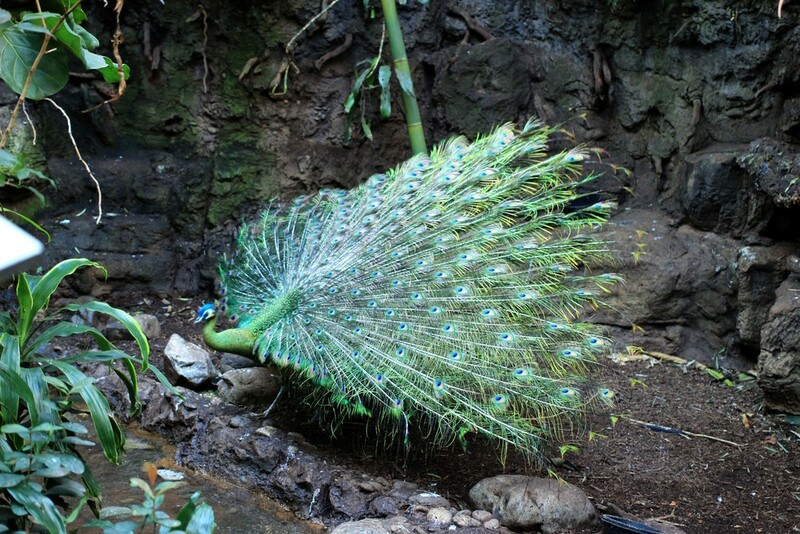 This peacock nearly landed on me while I was there - no joke - so, prepare yourself to be up close and personal! To me there’s something so wacky and retro about the idea of going to a zoo in the middle of the city. I could picture it in the sequel to The Mixed Up Files of Mrs. Basil E. Frankweiler. Or maybe it’s the next stop after Tiffany’s and the Five & Dime on Holly and Paul Baby’s day of trying new things. Think about it. Right now there are thousands of people who have penguins for neighbors. Those penguins have some pretty fancy real estate and the snow monkeys have a great view of the Plaza. Highlights for me were the red pandas - adorable!, the sea lion demonstration, and the snow leopard cubs. What is it about taking pictures of wildlife that makes me channel Austin Powers’s fashion photographer? Check out that attitude on the snow leopard cub - I'm pretty sure this was the female and she was definitely working it. “You’re an animal, baby! Yeah, fierce, baby!” Tyra would be proud. Naturally, Central Park Zoo is smaller than say the National Zoo in Washington, DC; but I think its small footprint is what makes it so charming. It also means that you can take your time and still see all the exhibits in a few hours rather than committing a full day. And, because it’s so centrally located - no pun intended - it’s possible to be window-shopping on Fifth Ave just a few minutes later. I really enjoyed my visit and I’d definitely recommend it for anyone who wants a little something different on their next trip to the city.